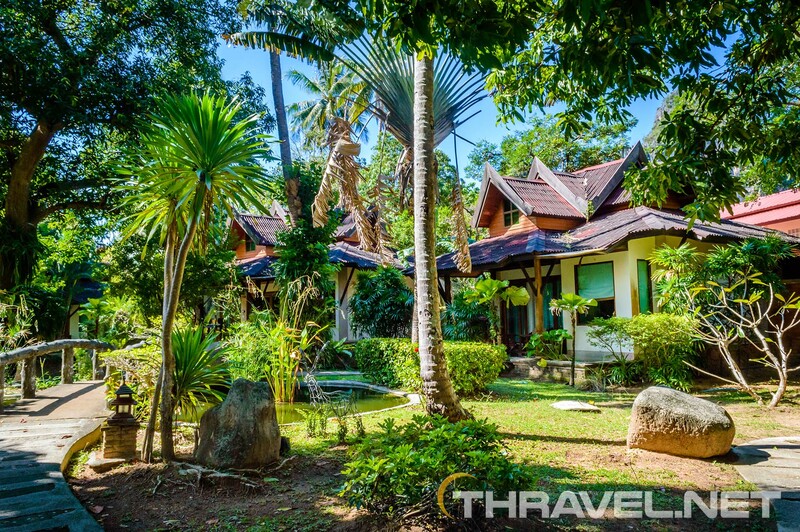 Railay beach hotels are an ultimate choice for travelers who wish to enjoy the stunning beauty of Southern Thailand. 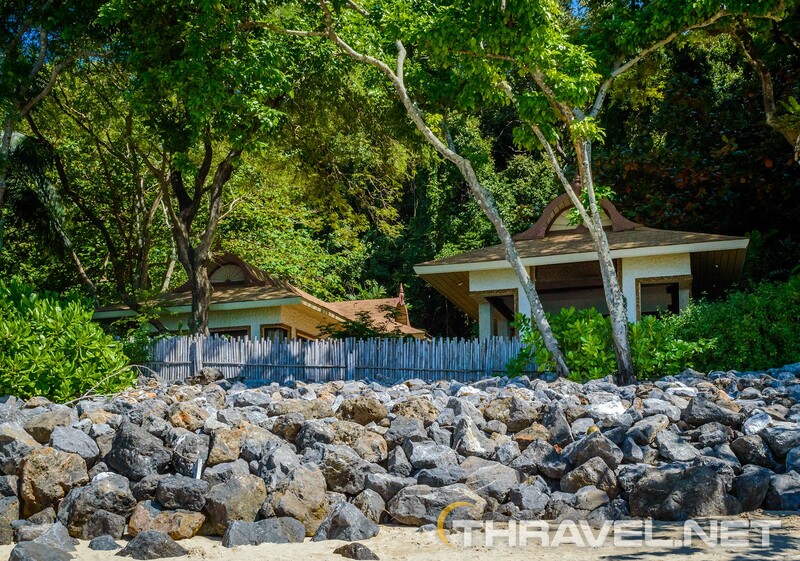 The Railay peninsula seems to be one of the last places without urban infrastructure. The place is only accessible by boats, there are no roads or streets there. Everything, including garbage is transported by boat from and to the mainland. It is impossible to see a vehicle different from a boat or sea tractor. Thus, tourists can benefit from one of the one of the advantages of modern civilization- high speed internet. Wi Fi is quite good in most of the resorts and restaurants. 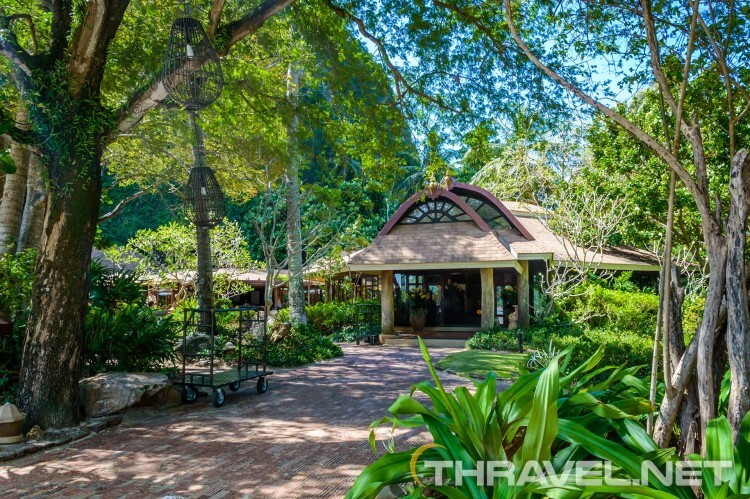 The hotels’ grounds are spectacular and it is a wonderful experience to walk around and explore. 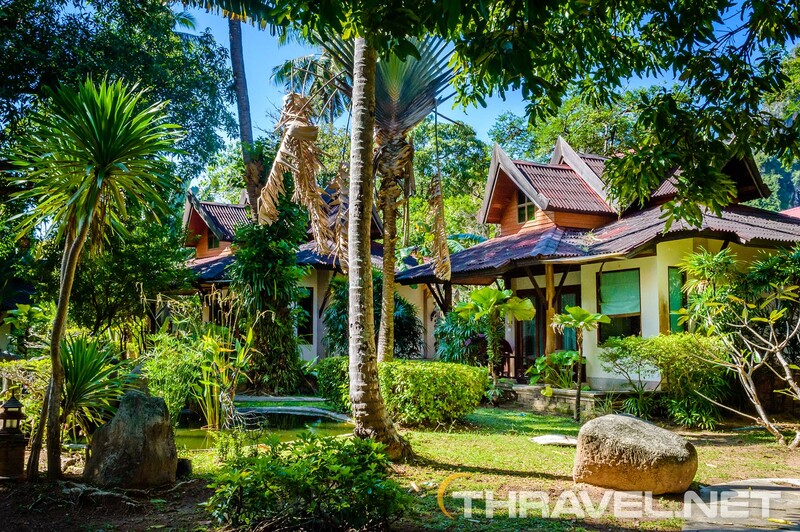 The remoteness of the place makes hotels on Railay beach most sought for an authentic tropical vacation. 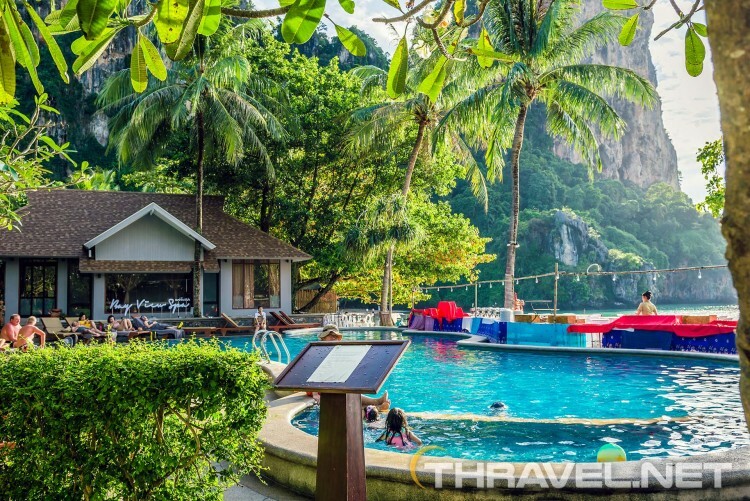 Railay hotels are more expensive than those in the lively Ao Nang beach. Still, there are reasonable options. 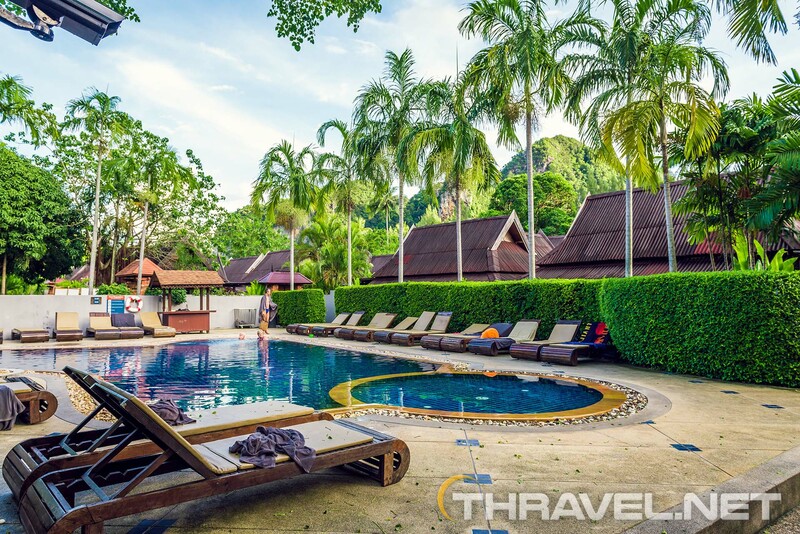 We have a special review of one of the value resorts on the peninsula – Railay Princess resort. 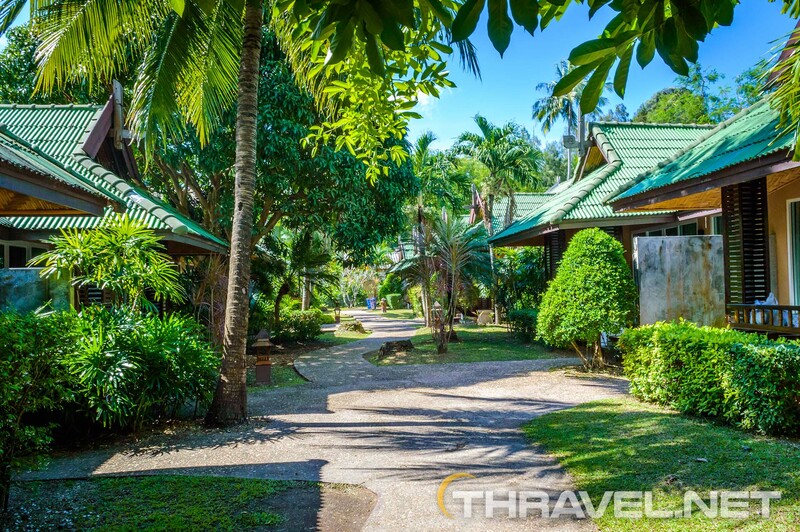 Here are a few more nice hotels on Railay beach. 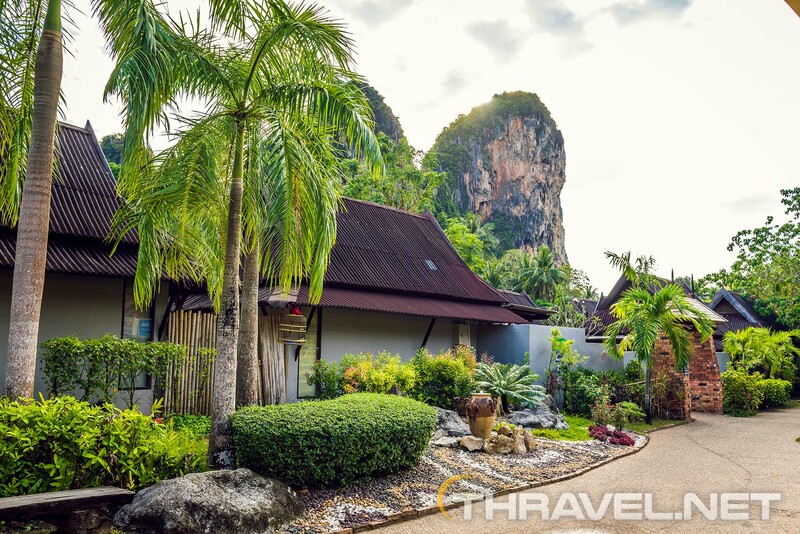 Sunset Tropical resort is set on Railay East. 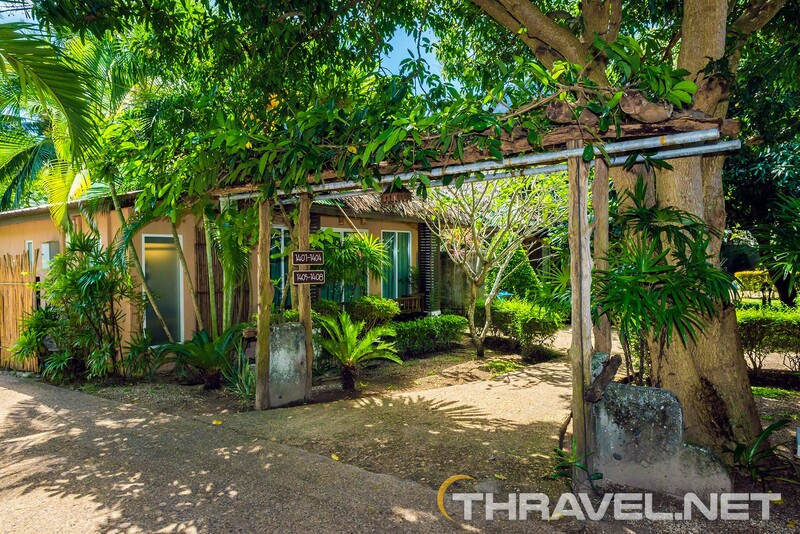 The property is facing the beautiful bay. 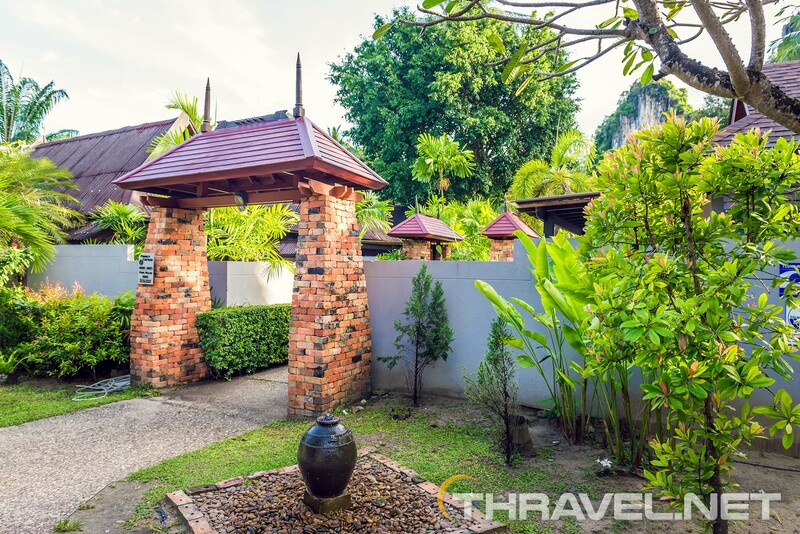 It is situated between Railay Princess resort and Railay bay resort. 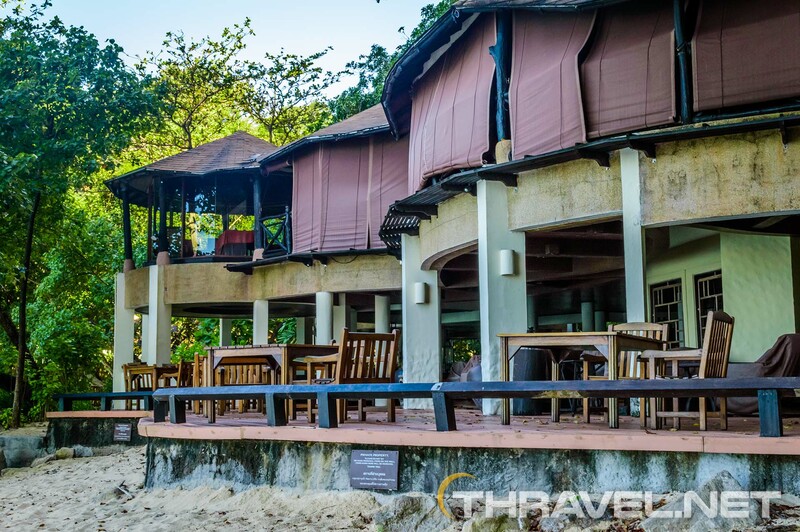 At low tide, there is a sandy shore in front of the resort. The hotel features nicely designed reception that overview the ocean. 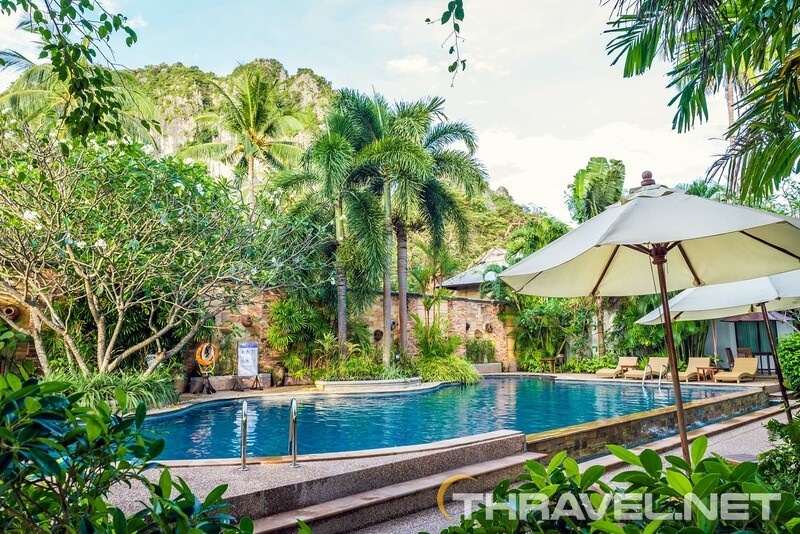 Near the beach, there are two-storey buildings, and a small swimming pool overlooking the East Railay bay. 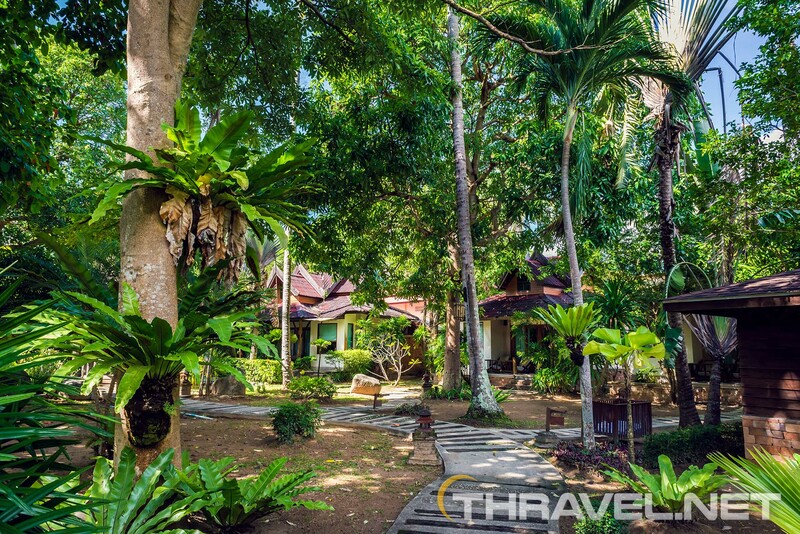 All buildings are surrounded by lush tropical vegetation. 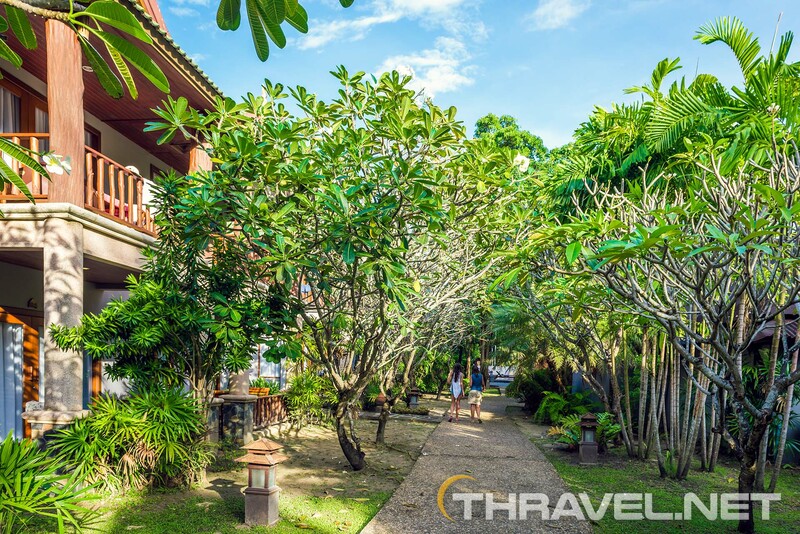 Inside the garden, there are also one-storey villas set in a rich vegetation. Along the paths there is a botanical garden with Jackfruit tree, Mango tree, etc. Among the buildings there are artificial lakes with fountains. 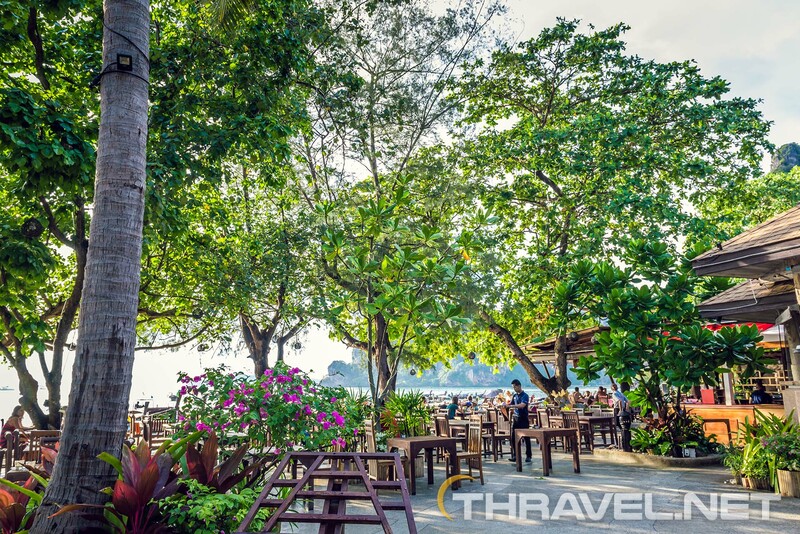 The Sunset restaurant is also overlooking the Andaman Sea. We tried the cuisine, especially Thai style dishes but the taste was mediocre. The main highlight of this hotel is the location. 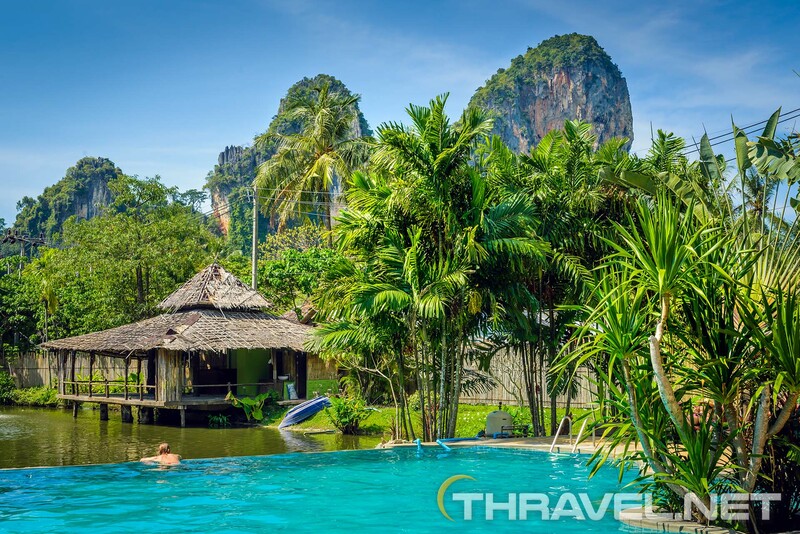 The resort is stretching from west to east Railay beach. 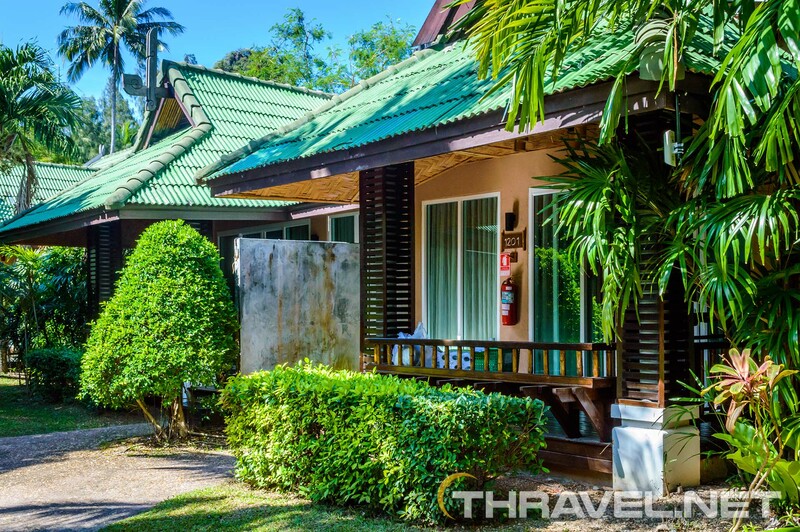 The accommodation overlooks both East and West Railay bay. In fact, the west part of the resort looks more attractive, developed and beautiful. The east area features villas with private yards surrounded by tall concrete fences. They look more like condominium than a tropical hotel. 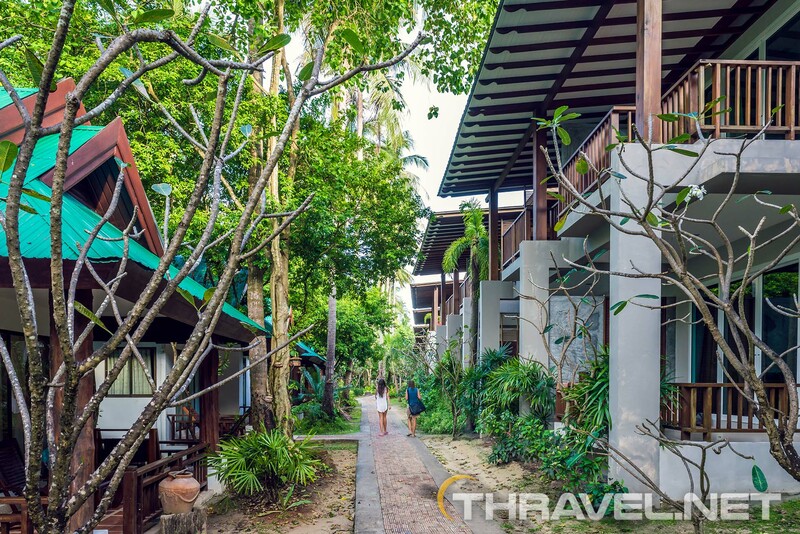 These buildings are arranged in few rows along the walking path between east and west Railay beach. 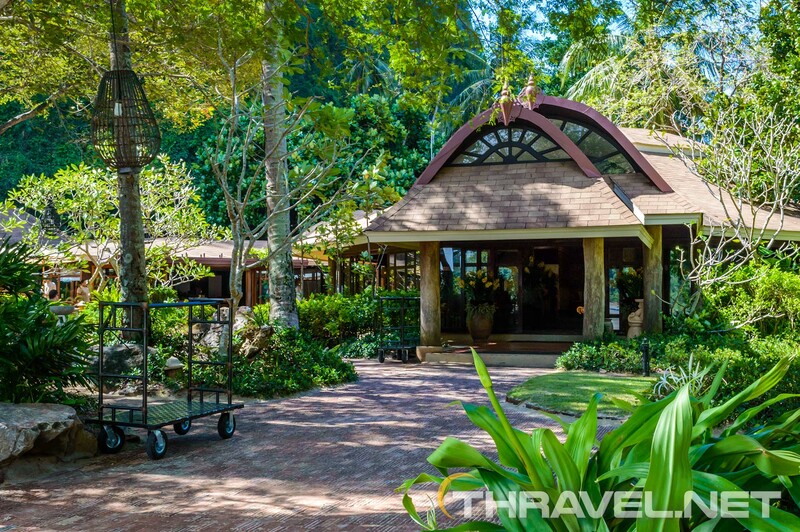 Near the eastern part of Railay Bay Resort and Spa there is a pharmacy that is closed most of the time, a mini market, and even an “Armani tailor studio”. 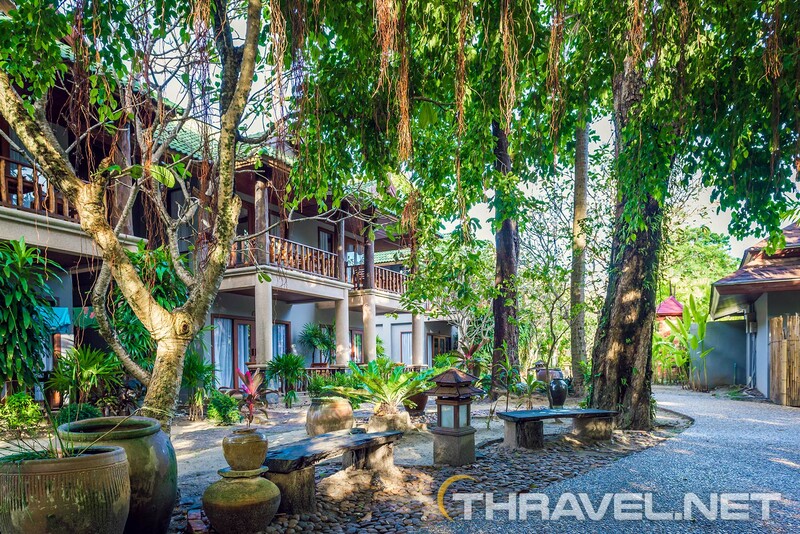 The west part of Railay bay hotel features 2-storey buildings in a traditional Thai style. 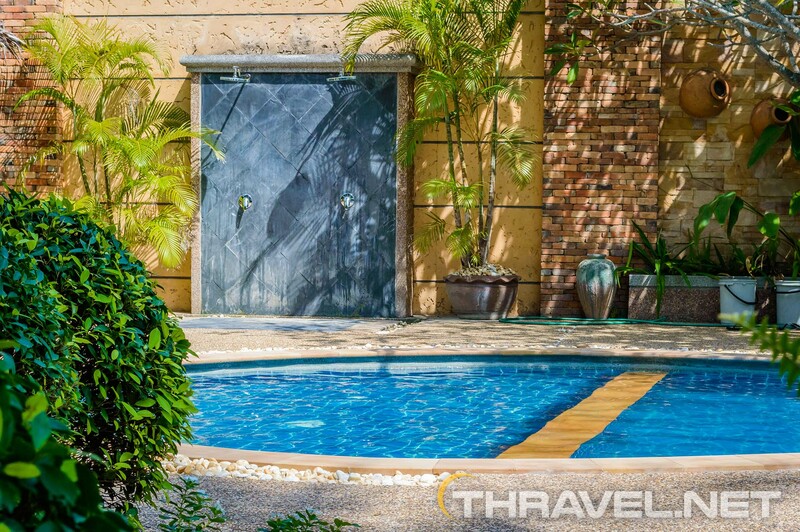 There are also a few cottages with private pools. 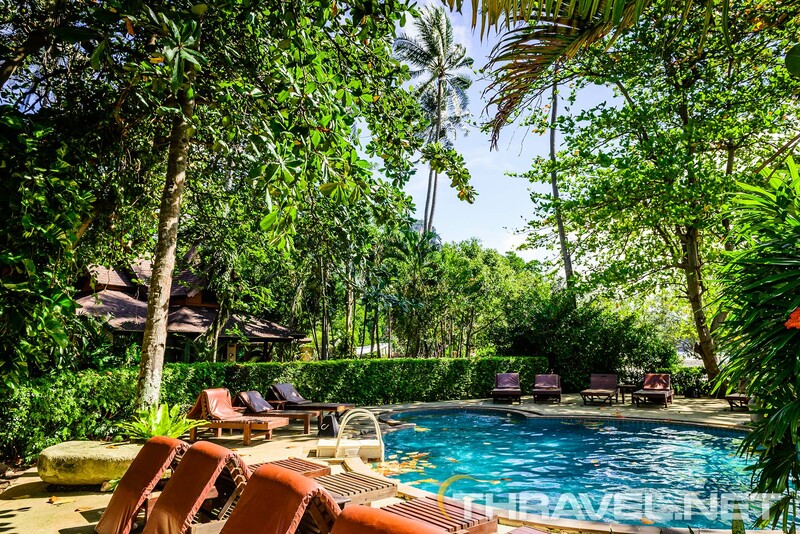 The hotel’s swimming pool is centered around an isle with tropical vegetation. 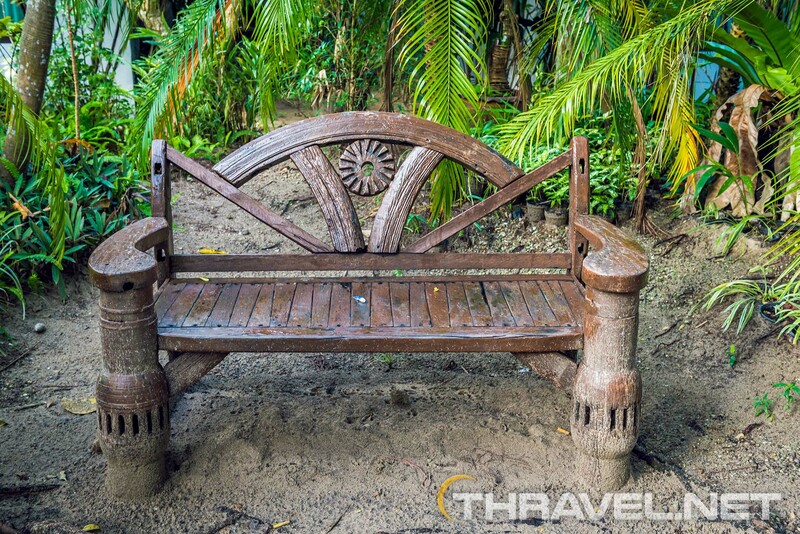 This was the thing we most liked in Sand Sea resort. 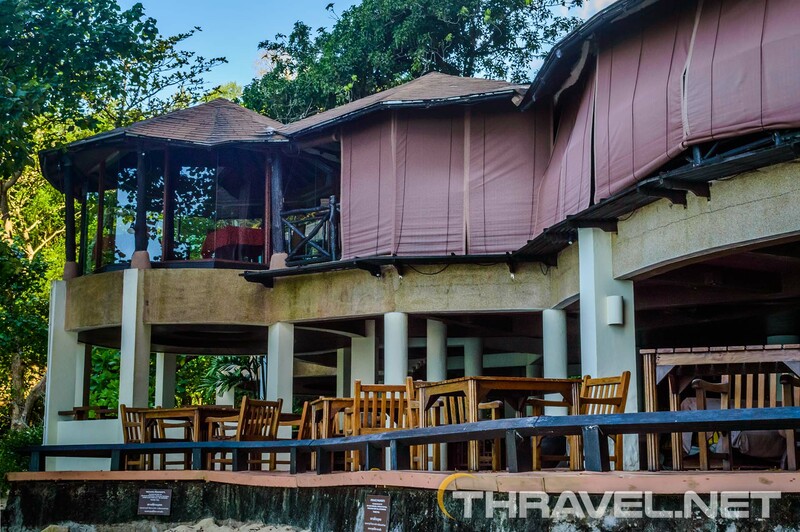 Sand Sea Resort is on the west coast of the peninsula. 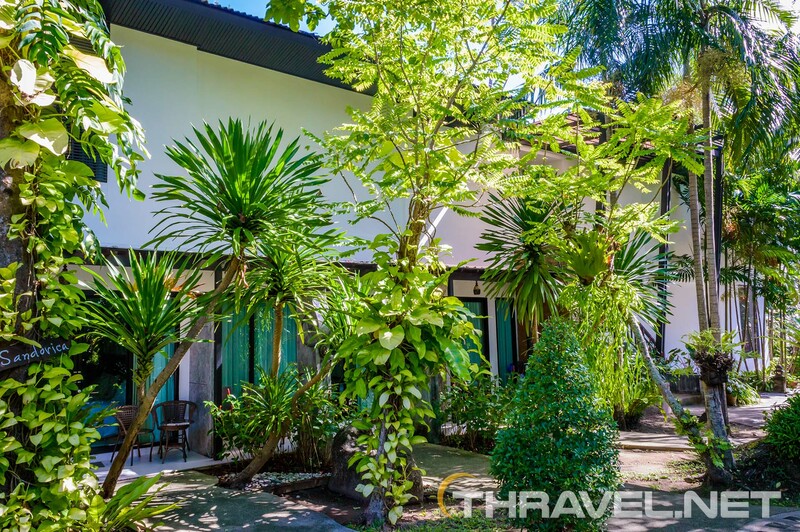 The accommodation offers villas and rooms in two-storey buildings. They all look a little outdated but comfortable. Most of the balconies are equipped with sofa beds. 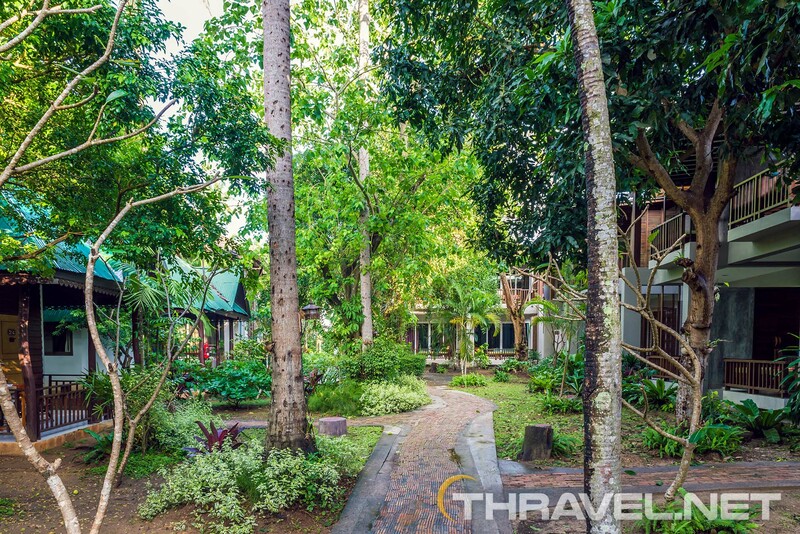 Hotel’s building are arranged in beautiful tropical gardens with rich vegetation so that guests can enjoy peace and quiet. 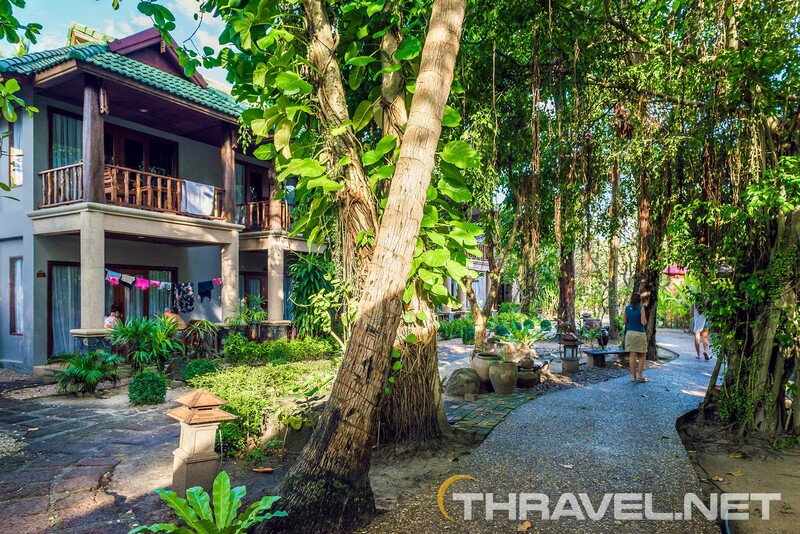 The landscape makes guests feel as they are far from the noisy and crowded Railay beach. 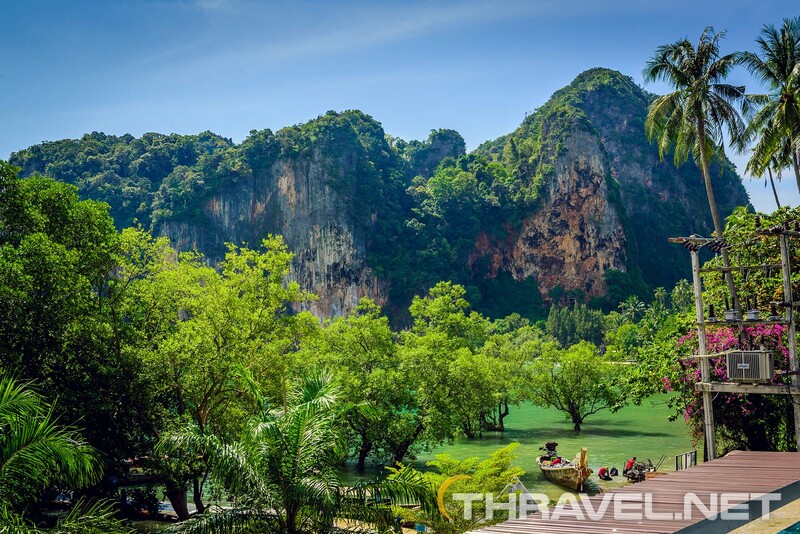 The coast is packed with long tail boats mainly because Railay is a hotspot for daily tourists from Ao Nang, Phuket and Krabi town. Still, in the afternoon, when the crowds disappear, hotel’s guests are able to enjoy the spectacular sunset just a few meters of their rooms. 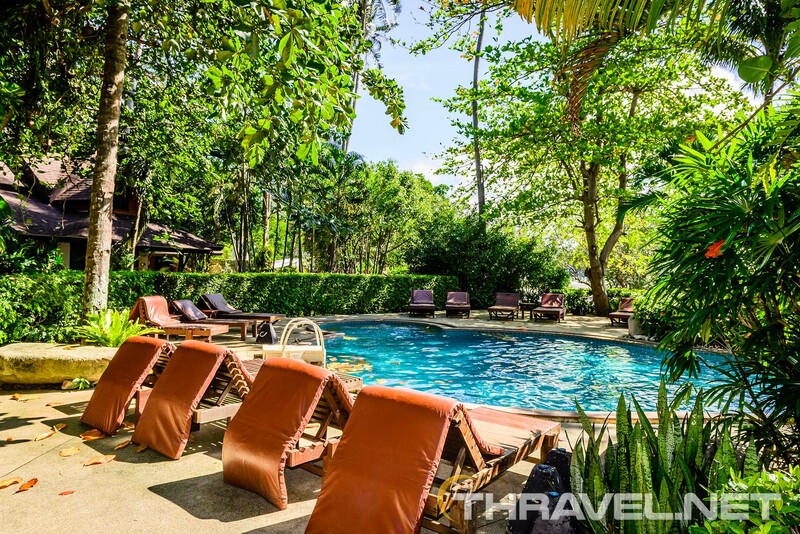 Railay village resort features perfect location for people looking both for a lively resort and a stunning landscape around it. 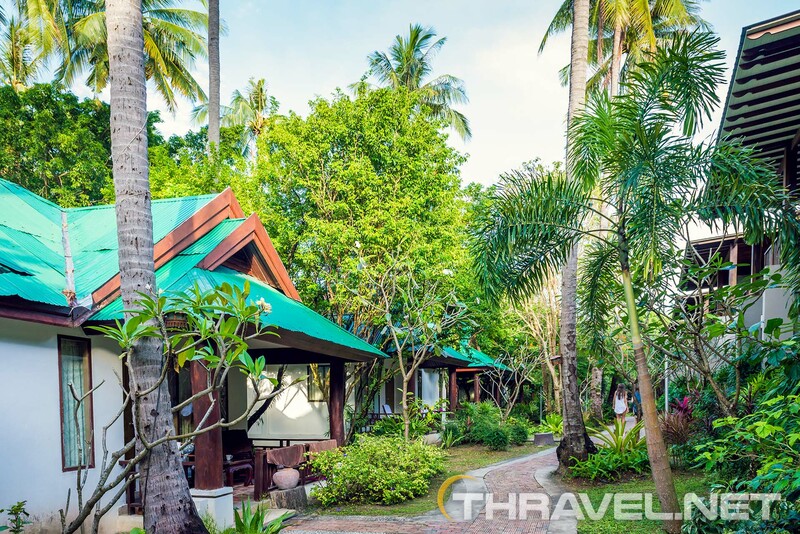 The accommodation is on Railay beach where most of the time hundreds of tourist wonder around. 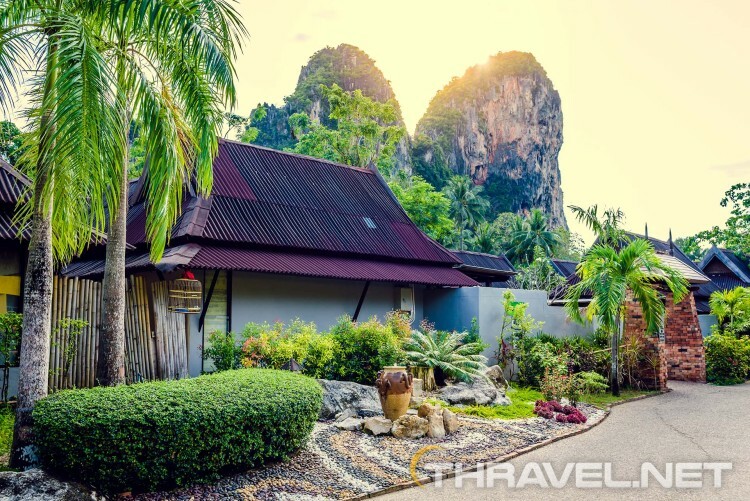 Since Railay beach is one of the most popular natural attractions in Southern Thailand, many tourists from other resorts come to see its extraordinary beauty. 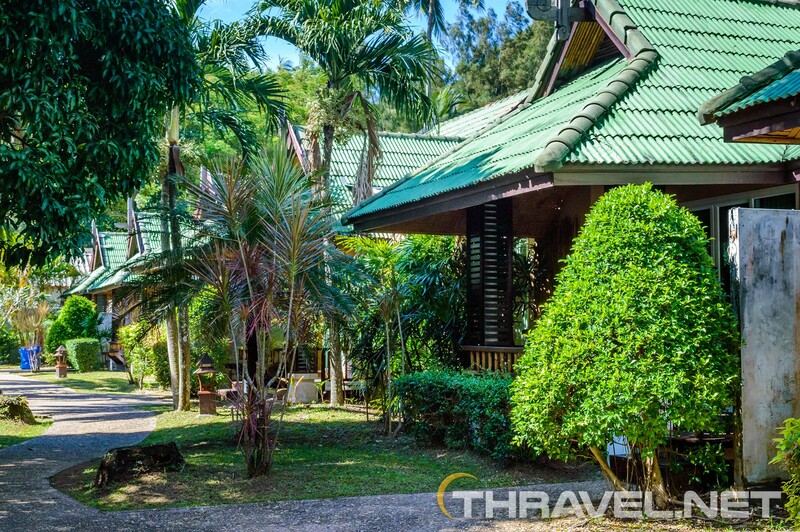 What distinguishes Railay village resort from the other hotels, is the intriguing landscape design. Each villa has his own lake. 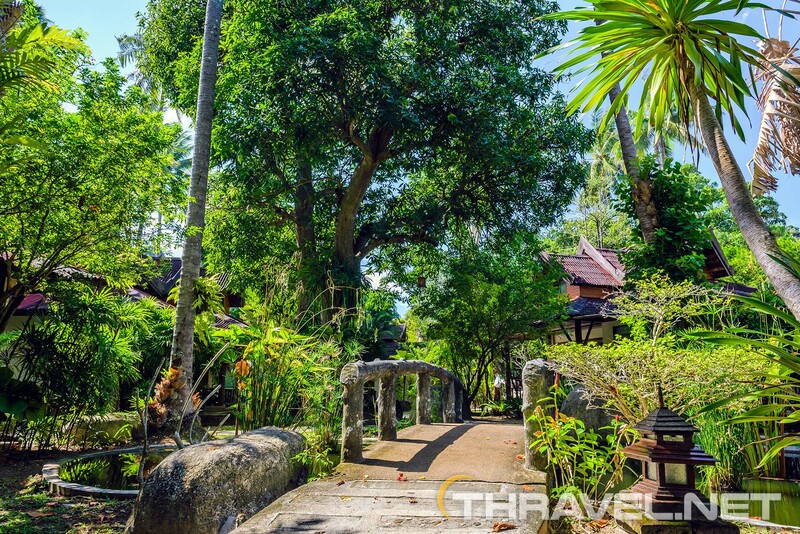 From the main path across the buildings you can reach your bungalow by crossing a stylish stone bridge. 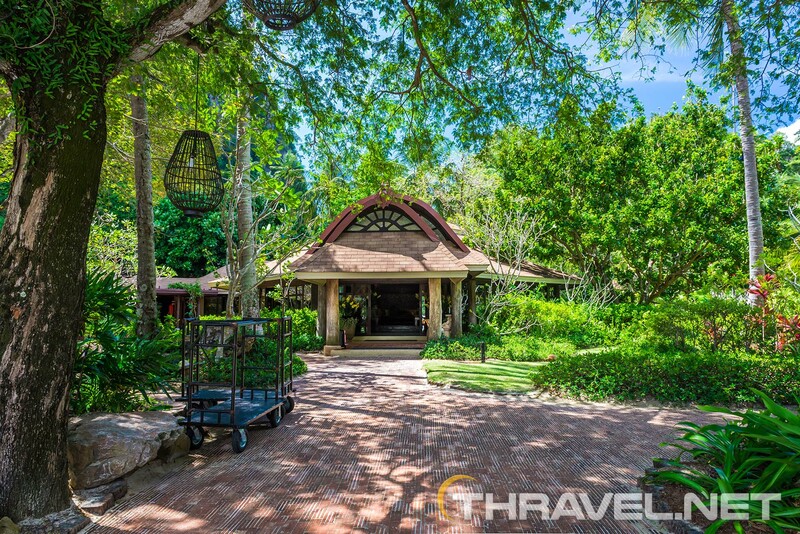 The outdoor living area is also charming and reminds the ambiance of a fairytale story. Villas feature thatched roofs that add to the charm of the place. 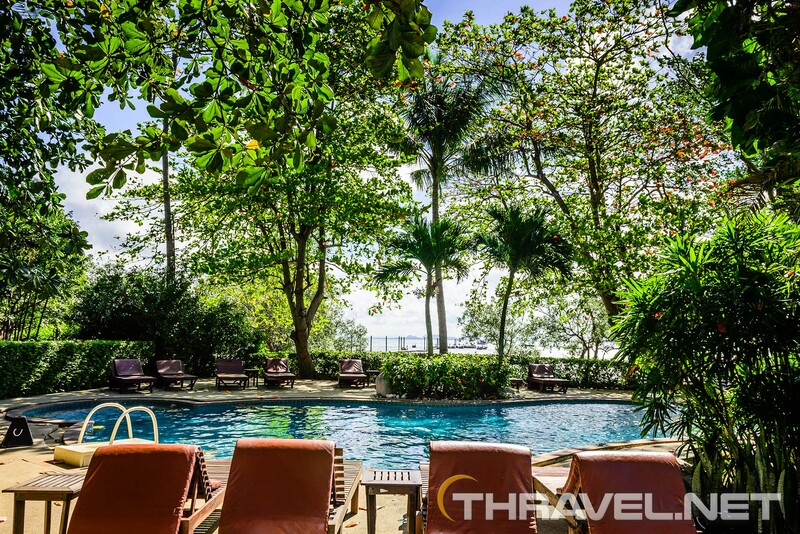 There is a small pool close to the sea and a bigger one in the hotel’s premises. 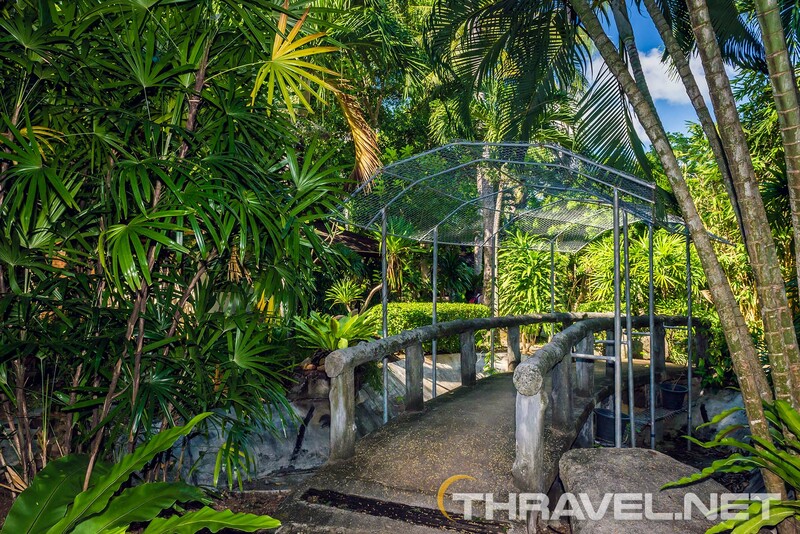 Both are surrounded by a tropical landscape. 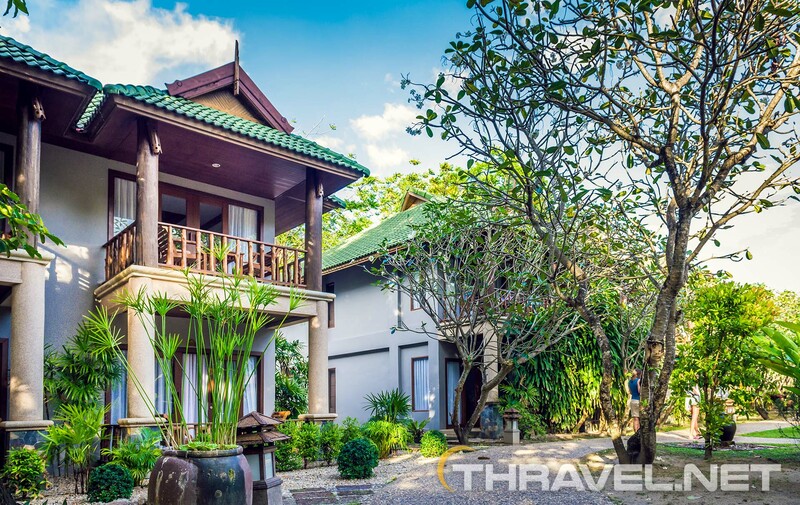 The luxurious 5-star Rayavadee Resort is the only one with an access of two beaches – Railay beach and Phra Nang beach. 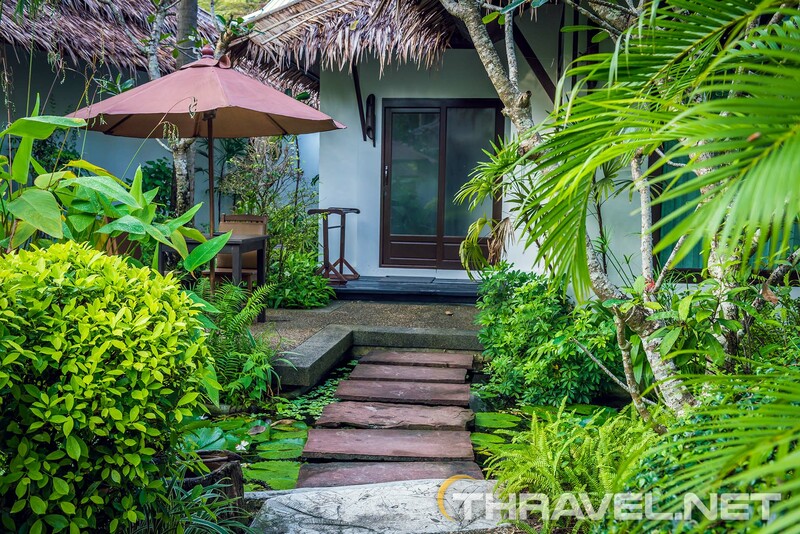 The exclusive accommodation also stretches on a huge territory from east to west coast of the peninsula. 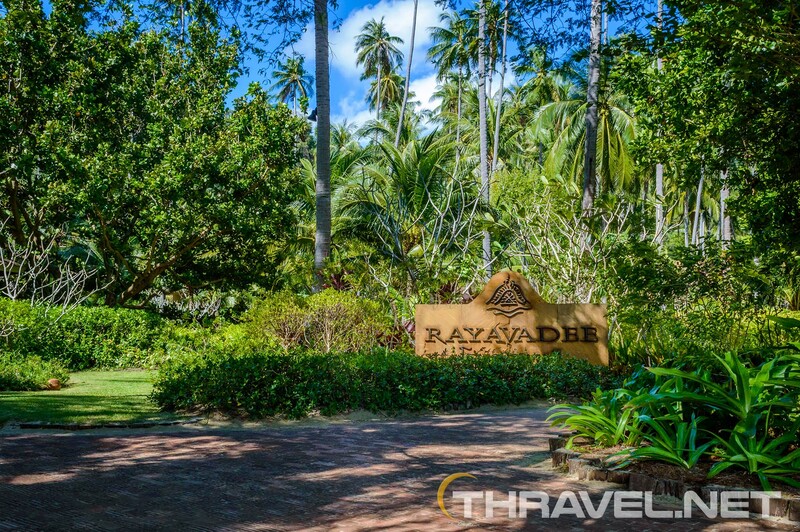 Rayavadee’s guests benefit from a private transfer to the hotel’s reception – by motorboat at high tide and by sea tractor at low tide. The resort is set close to the mountainous part of Phra nang national park so hotels guests are likely to encounter many representatives of the wild life – monkeys, lizards and birds. The property is full of wilderness. 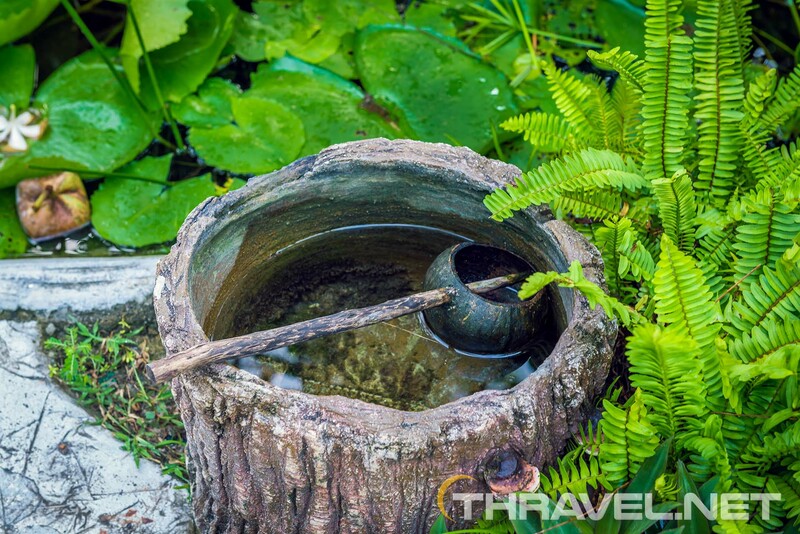 In hotel’s lush green tropical gardens can be seen Langur monkeys, Maquac monkeys and lizards. 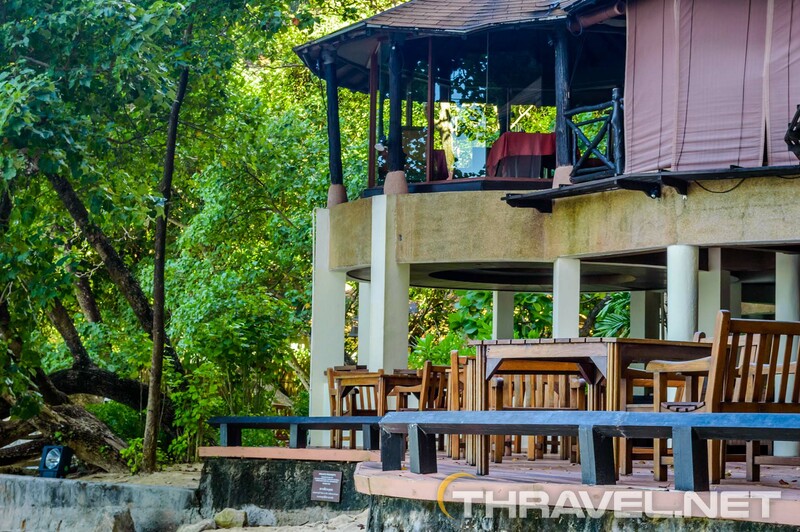 Although Rayavadee looks a quiet oasis, resort’s exclusive guests need to share the paradisial beach with other tourists. 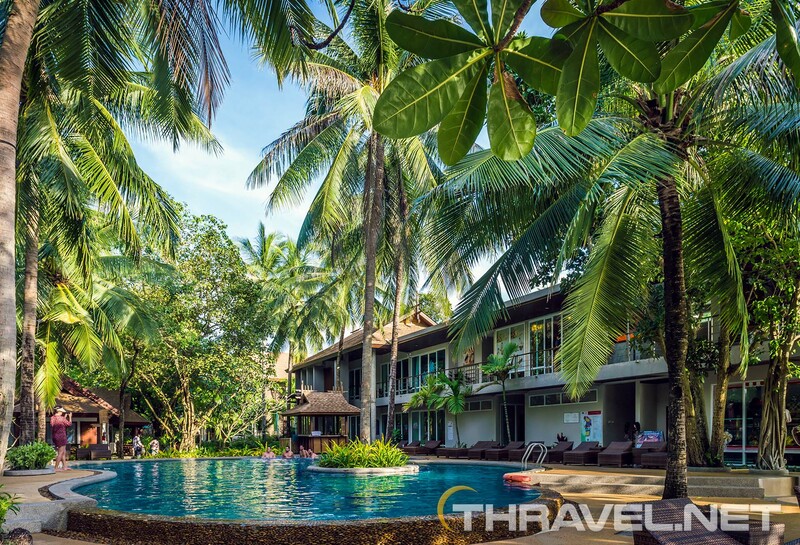 Still those who want to be surrounded by an idyllic luxury can stay at Rayavadee’s beautiful swimming pools. 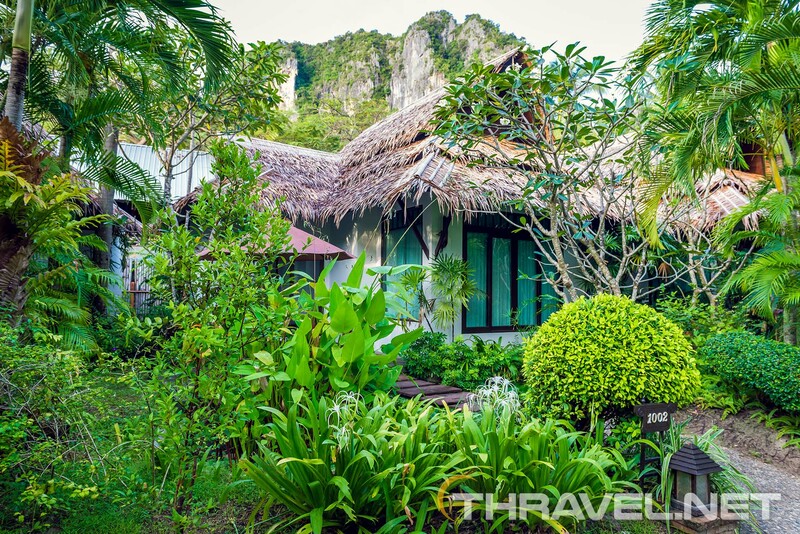 No matter which hotel on Railay beach you choose you will enjoy the beauty of an exclusive piece of nature in Thailand. It might look crowded and noisy but compared to other resorts in Thailand, Railay is an idyllic paradise!